In this special edition of the podcast, the voices of the people who saved a piece of American spaceflight history tell the tale of reviving an obsolete piece of audio equipment that was vital to digitizing the voice recordings of the Apollo 11 flight controllers in Houston. HWHAP Episode 88. Dr. Andy Feinberg and Dr. Steve Platts discuss the history and details behind the Twins Study. The experts reveal some of the findings from the multi-year endeavor packed with 10 different investigations. HWHAP Episode 87. Jonathan Abary, Pathways program manager, and Alexis Vance, Pathways intern in the crew and thermal systems division, discuss the Pathways internship program at NASA Johnson Space Center. HWHAP Episode 86. Prominent local business leaders Cindy DeWease, William Harris, and Bob Mitchell discuss how the presence of the Johnson Space Center in Houston impacts the community and vice versa. HWHAP Episode 85. Steve Barsi, European Service Module Propulsion Subsystem Manager, discusses the Orion spacecraft’s propulsion system, how it works and why it's suited for deep space travel. HWHAP Episode 84. Spacewalk experts Tara Jochim and Art Thomason discuss the intense planning over months and sometimes years that goes into the complicated choreography of a spacewalk. HWHAP Episode 83. NASA Astronaut Christina Koch and her husband, Bob Koch, discuss Christina's path to becoming an astronaut—her childhood in North Carolina, her education, and her work at NASA’s Goddard Space Flight Center and in remote locations all around the world—as she gets ready to make the first spaceflight of her career. HWHAP Episode 82. Mohammed Saibu and Juan Carlos Lopez, who are pursuing leadership roles at NASA through a program called FIRST, discuss some of the challenges of leadership and how this program will build successful leaders who will be the ones to put boots on our nearest celestial neighbors. HWHAP Episode 81. Steve Stich, Deputy Manager for Commercial Crew, discusses how we are once again launching astronauts from American soil. Stich talks about the astronauts flying in the commercial crew spacecrafts, the upcoming test missions, and the role of private industry in the future of human spaceflight. HWHAP Episode 80. John Lewis, Orion ECLS (Environmental Control and Life Support) system manager, discusses how the Orion spacecraft will keep the crew inside comfortable – and more importantly, alive – during a mission into deep space. HWHAP Episode 79. Expert guests from the Apollo program reveal more behind the challenges faced to successfully land humans on the Moon in less than three years after the tragic Apollo 1 fire. HWHAP Episode 78. Vanessa Wyche, Deputy Director of the Johnson Space Center, leads a panel discussion with key players of the Apollo program to learn critical lessons that can be applied to NASA’s future human spaceflight missions to the Moon and Mars. HWHAP Episode 77. On the 50th anniversary of the Apollo 8 launch, resident historian Dr. Jennifer Ross-Nazzal recounts one of the most significant missions in human spaceflight history, featuring interviews with Apollo 8 astronauts Frank Borman and Bill Anders. HWHAP Episode 76. Matt Lemke, Orion avionics, power and software deputy manager, discusses how Orion is radiation-hardened so the systems inside can withstand the harsh environment of space. HWHAP Episode 75. NASA Astronaut Anne McClain discusses her journey to space, from her education, her time in the Army as an aviator, and her training to become an astronaut. HWHAP Episode 74. Jerry Ross, former NASA astronaut, talks about the first mission to assemble the International Space Station and his experience conducting the mission's three spacewalks. The milestone shuttle mission STS-88 brought the Unity module to join Zarya, the first element of the space station. HWHAP Episode 73. Doug Drewry, former FGB Program Manager, discusses leading the joint U.S and Russian teams during the development and launch of Zarya, the first element of the International Space Station, for its 20th anniversary in space. HWHAP Episode 72. John Gruener and Dr. Jennifer Ross-Nazzal, planetary scientist and historian, respectively, team up to discuss both the science and history of the Apollo program, the Moon, and the Johnson Space Center. HWHAP Episode 71. Dr. Lucie Low, Scientific Program Manager at the National Institutes of Health, talks about tiny devices the size of the thumb drive that replicate the structure and function of human organs. Low discusses the importance of testing these devices in space. HWHAP Episode 70. Dr. Greg Holt, Navigation Lead for the Orion spacecraft, discusses how the vehicle finds its way through deep space and communicates with Earth along the way. HWHAP Episode 69. Bob Jacobs, Bert Ulrich, and Bill Barry share stories of NASA working closely with filmmakers on features and documentaries. The cast and crew of "First Man" and family members of the real astronauts portrayed in the film also share their perspective on human spaceflight. HWHAP Episode 68. NASA's 60th Anniversary - Live! For NASA’s 60th Anniversary, Houston We Have a Podcast took to the stage with science fiction writers Mary Robinette Kowal, Dan Wells, Howard Tayler, and publishing agent DongWon Song, as well as NASA astronaut Kjell Lindgren to discuss how real science and science fiction have influenced each other. HWHAP Episode 67. Ronny Baccus, Orion structures and thermal protection system functional area manager, discusses how Orion deals with temperatures around 5,000°F when screaming back into Earth's atmosphere at 25,000 miles per hour. HWHAP Episode 66. NASA astronaut Nick Hague and his wife, Lt. Col. Catie Hague, talk about Nick’s journey to becoming an astronaut, his education, and his time in the U.S Air Force. The couple discusses how their family is prepared for the journey ahead. HWHAP Episode 65. Dr. Steve Johnson, Senior Scientist of the Space Radiation Analysis Group, discusses what's being done right now to document radiation exposure, not only to ensure our astronauts stay healthy, but to understand weather in space. HWHAP Episode 64. NASA Administrator Jim Bridenstine and Johnson Space Center Director Mark Geyer describe the mission and direction of America's space agency after a visit from Vice President Mike Pence. The two agency leaders discuss commercialization, human missions to the Moon, and the difference between NASA and Space Force. HWHAP Episode 63. Jon Olansen and Jenny Devolites, leads for the Orion Ascent Abort-2 (AA-2) crew module and AA-2 launch abort vehicle test mission, discuss the critical test of the abort system if a failure were to happen while the Space Launch System rocket was ascending. HWHAP Episode 62. Dr. Brian Crucian, a biological studies and immunology expert, discusses the hazard of hostile and closed environments in space. Crucian serves as the principal investigator for a NASA functional immune study. This is part five of the five-part series on the hazards of human spaceflight. HWHAP Episode 61. Dr. Peter Norsk, Senior Research Director and Element Scientist at Baylor College of Medicine based here at NASA, describes the hazard of altered gravity fields and its effects on the human body. This is part four of a five-part series on the hazards of human spaceflight. HWHAP Episode 60. Dr. Erik Antonsen, element scientist and emergency physician, discusses the hazard of traveling farther away from Earth an ever before, especially how to provide appropriate medical care with limited resources and challenging communications. This is part three of a five-part series on the hazards of human spaceflight. HWHAP Episode 59. Dr. Tom Williams leads a research team that looks into isolation and confinement, focusing on habitability and behavioral health and performance risks to spaceflight. This is part two of a five-part series on the hazards of human spaceflight. HWHAP Episode 58. Dr. Zarana Patel, a portfolio lead scientist at NASA's Johnson Space Center, is responsible for management and scientific oversight of degenerative tissue risk of space radiation. This is part one of a five-part series on the hazards of human spaceflight. HWHAP Episode 57. Dr. Mike Barratt, NASA astronaut, physician and a flight surgeon, shares his story of living in space. Barratt addresses five hazards of human spaceflight and why these challenges need to be addressed to make deep-space missions successful. HWHAP Episode 56. John Gruener and Steve Hoffman discuss in-situ resource utilization (ISRU), the ability to find and use natural resources beyond Earth. HWHAP Episode 55. Tabi Taliwaku Kalisa, program manager of NASA's Small Business Programs, shares how NASA helps small businesses to get involved in space exploration and scientific discovery by working with them from the spark of an idea to literally being a part of the space industry. HWHAP Episode 54. Mars is Hard. Here's Why. Dr. Stan Love, NASA astronaut and all-around smart guy, flew to the International Space Station in 2008 and has worked on a number of flight analog programs to understand how to conduct deep-space missions. Love explores the challenges that will need to be tackled to make a mission to Mars successful. HWHAP Episode 53. Houston, We Have a Podcast celebrates its first year. Gary Jordan (host) sits down with Alex Perryman (audio) and Dan Huot (co-host) to reminisce about their favorite moments and incredible guests. HWHAP Episode 52. Harry Roberts, Flight Operation Supervisor for the Aircraft Operations Division out at Ellington Field Airport, talks about aeronautics at NASA. Roberts describes the operations out at Ellington Field and the aircraft itself that helped to make human spaceflight possible. HWHAP Episode 51. Dr. Sarah Wallace talks about her instrumental role in sequencing DNA for the very first time in space. DNA sequencing can be used for things in space from monitoring the crew members' health to identifying microbes, and potentially detecting life in the solar system. HWHAP Episode 50. Kathy Lueders, Manager of the Commercial Crew Program, gives us a brief history of the program, how it started, and where it is now. Leuders talks about the 2 commercial companies, Boeing and SpaceX, and their space vehicles that will carry astronauts into low Earth orbit. HWHAP Episode 49. Ryan Zeigler, a planetary scientist and the lunar sample curator, talks about the moon rocks brought to Earth during Apollo, the facilities that keep them, and what were still learning from them. HWHAP Episode 48. Serena Auñón-Chancellor shares her story about becoming an astronaut from her education in engineering and medicine to her time at NASA as a flight surgeon. Auñón-Chancellor discusses her training and expectations before her first trip to space. HWHAP Episode 47. For Asian Pacific American Heritage Month, we team up with our Asian Employee Resource Group to share the stories from 4 guests on their unique paths coming to NASA from different backgrounds. HWHAP Episode 46. Annette Moore, the Director of Information Resources and the Chief Information Officer at the Johnson Space Center, tells us about data and information in space as well as the tech we use for human spaceflight operations, including space station imagery and how it's changed over time. HWHAP Episode 45. Dr. Scott Smith, NASA nutritionist and the manager for nutritional biochemistry, discusses the differences in the way astronauts have to eat in space versus the way we eat here on Earth. HWHAP Episode 43. Colonel TJ Creamer shares his story from humble beginnings in the military to tweeting from the International Space Station. Creamer describes his transition as the first and only individual to be both an astronaut and a flight director. HWHAP Episode 40. Rajib Dasgupta and Gerard Valle talk about the commercial test module currently attached to the International Space Station called the Bigelow Expandable Activity Module (BEAM). The respective former and current project managers for BEAM discuss the history and future of expandable spacecraft. HWHAP Episode 39. For Women's History Month we brought in 4 women in leadership at the Johnson Space Center to share their stories of persevering through challenges and rising through the ranks. HWHAP Episode 38. Dr. Tina Holden, Human Factors Technical Fellow with Leidos, talks about the challenges that astronauts may face when interacting with computers. Holden discusses some of the research that has been done on the space station to investigate these issues. HWHAP Episode 37. Ricky Arnold, NASA Astronaut, talks about his time as an educator, his first flight on the Space Shuttle, and his plans to teach from space during his first long-duration flight on the International Space Station starting on March 21, 2018. HWHAP Episode 36. Jeff Fox, Chief Engineer of the Rapid Prototype Lab, talks about some of the testing and training for Orion. Fox brings the actual audio from inside the Orion capsule during its first flight so you, the listener, can experience what it would be like to ride inside the spacecraft. HWHAP Episode 35. Drew Feustel, NASA Astronaut, talks about his education in Geology and Seismology, his previous 2 shuttle missions, and his expectations before launching on March 21, 2018 for his first long-duration mission in space. HWHAP Episode 34. Dr. Andrea Hanson, Exercise Countermeasures Operations Lead, talks about what happens to the human body in microgravity, what NASA is doing about it, and how we can use this knowledge to go deeper into space. Hanson also describes some parts of astronaut exercise that have inspired her workouts. HWHAP Episode 33. For African American History Month, we team up with our African American Employee Resource Group to bring 4 guests from different areas of expertise like life support systems, robotics, flight control and leadership to explain what they do and the paths they took to work at NASA. HWHAP Episode 32. Jonathan Homan, Project Manager for Webb's Chamber A Testing, talks about how the James Webb Space Telescope has been designed, built, and tested, especially in the vacuum chamber here at the Johnson Space Center. He also describes what the telescope will be looking for in the universe and how it will work. HWHAP Episode 31. Dr. Duck Mittlefehldt, Planetary Scientist, talks about some curious findings in meteorites and the adventures endured to procure them. HWHAP Episode 30. Patrick O'Neill, Marketing and Communications Manager at CASIS, talks about the part of the International Space Station designated as a U.S. National Laboratory, what that means, and how CASIS manages research from all over the world that could ultimately benefit humankind. HWHAP Episode 29. Jessica Vos, Crew Systems Engineer, talks about how astronauts will operate in the Orion capsule for deep-space missions that can go up to 3 weeks: like how they’ll eat, sleep, exercise, work, and if needed, be prepared for the worst. HWHAP Episode 28. Dr. Aaron Burton and Dr. Marc Fries, Planetary Scientists, talk about searching for organic material in meteorites from around the solar system. They share what we're finding that helps us understand the fundamentals of life here on Earth and possibly the universe. HWHAP Episode 27. Bill Foster, Ground Controller in Mission Control Houston, talks about how space communication networks work and what they will look like for missions into deep space. HWHAP Episode 26. Lisa Spence, Flight Analogs Project Manager, and Dr. Paul Haugen, HERA Operations Engineer, talk about the space habitat analog here in Texas. They talk about what it's like inside, what crewmembers do on missions, and how to sign up to participate in this study. HWHAP Episode 24. Scott Tingle, NASA Astronaut, talks about his education in mechanical engineering, his time in the Navy as a test pilot, and his astronaut training before his first mission to the International Space Station in December, 2017. HWHAP Episode 23. Dr. Natacha Chough, Flight Surgeon, talks about what flight surgeons do and how they work with astronauts to monitor their health during spaceflight. She reveals health concerns that are unique to the space environment. HWHAP Episode 22. Mike McGlone, NASA Education Specialist, talks about how the different education programs here in Texas influence students to pursue careers in STEM and STEAM fields, including careers here at NASA. HWHAP Episode 21. Shane Kimbrough, NASA Astronaut, and Dennis Leveson-Gower, Senior Project Scientist at NASA's Ames Research Center, talk about cargo and science going to and from the International Space Station. 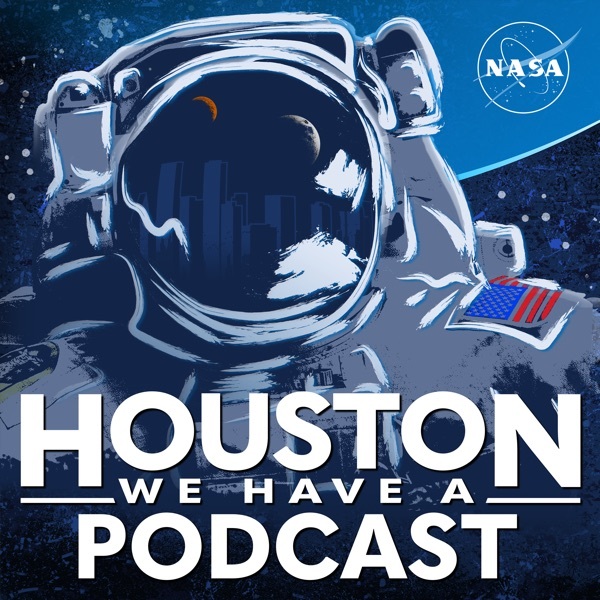 Houston We Have a Podcast teams up with NASA in Silicon Valley Podcast. HWHAP Episode 20. Tim Garner, Meteorologist in Charge at the Johnson Space Center, talks about how weather affects human spaceflight, especially for launches, landings, and tests. He also reveals how Hurricane Harvey impacted operations here in Houston. HWHAP Episode 19. Dr. Doug Archer, Planetary Scientist, talks about Mars: what its made of, what it's like on the surface, and why it's such an intriguing place for humans to visit in the next giant leap. HWHAP Episode 18. Nujoud Merancy, Mission Planning and Analysis Lead for the Orion spacecraft, talks about what Orion is, how it will work, what kinds of tests are being done, and where in space it will go. HWHAP Episode 17. Les Padilla, Hardware Manager of the Extravehicular Mobility Unit (EMU), talks about spacesuits: how they work, what they're made of, how they've evolved over time, and what they'll look like in the future. HWHAP Episode 16. In a live recording from space, astronauts Randy "Komrade" Bresnik, Paolo Nespoli, Joe Acaba, and Mark "Sabot" Vande Hei talk about about photography and the view of Earth from the International Space Station. HWHAP Episode 15. Tim Braithwaite, Liaison Manager for the Canadian Space Agency, talks about robotic arms in space: how they were conceived and developed, how they work today, and how the technology is useful on Earth. HWHAP Episode 14. Mark Vande Hei, U.S. astronaut, shares stories of his training and tips he learned from fellow astronauts before launching to the International Space Station for the first time on September 12, 2017. HWHAP Episode 13. Dr. Tara Ruttley, Associate Program Scientist for the Space Station, talks about the kinds of scientific research we're doing and learning aboard the orbiting complex. Ruttley discusses why the research is important for us here on the Earth and for sending humans into deep space. HWHAP Episode 9. Well as you probably know, southeast Texas was just slammed with the furious winds and torrential downpour of Hurricane Harvey. A lot of Houstonians were affected by the storm and the 40+ inches of rain that came with it. Here is a quick update of what has happened here in Houston. We'll be back with a full episode next week. Glenn Lutz and John Connolly, exploration experts at NASA, chat with Tommy Shaw and Lawrence Gowan from the band Styx about human exploration of the solar system. They discuss the challenges of sending humans into deep space and draw parallels to live music performances. HWHAP Episode 8. Dr. Mark Matney, Space Debris Scientist and Astronomer, talks about the science and history of eclipses. He also describes the total solar eclipse that will sweep over the U.S. on August 21, 2017, and how to safely view it. HWHAP Episode 7. Jack "2fish" Fischer, NASA Astronaut, talks about life on the International Space Station... while on board the International Space Station. This podcast was recorded during a live event on Aug 10, 2017. HWHAP Episode 6. Randy "Komrade" Bresnik talks about what astronauts have to study, know and endure to be successful in space. Bresnik recalls his astronaut training experiences and moments of his previous spaceflight. HWHAP Episode 5. Dr. Takiyah Sirmons, food scientist, talks about space food: what it is, how its packaged, and what happens to an astronauts palate after living in space for several months. HWHAP Episode 4. Dr. John Charles, Chief Scientist of the Human Research Program at the NASA Johnson Space Center, talks about what happens to the human body in space. NASA astronaut Shane Kimbrough gives a first hand account of landing from space. HWHAP Episode 3. Anne Roemer, Manager of the Astronaut Selection Office at the NASA Johnson Space Center, talks about the new Astronaut Class of 2017: who they are, what they bring to the table and why these 12 people were chosen out of more than 18,000 applicants. The 2017 class also plays “2 Truths and a Lie.” HWHAP Episode 2. Dan Huot, Public Affairs Officer at NASA’s Johnson Space Center, talks about the International Space Station: what it is, how it works, what it’s made of, and why it’s there. HWHAP Episode 1.